From the start, the United States of America aspired to be a land of opportunity—a land where people come for a better life and where every child can dream of working their way to the top. It has always been a true melting pot, attracting the best from around the world to mix in a polyglot society to produce a sum better, more productive, and more innovative than its parts. The resulting diversity is a national asset—helping the United States become the world’s leading nation. In this century, too, diversity will continue to power American society and the U.S. economy. 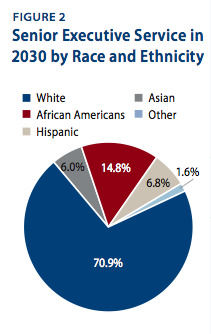 By the year 2050 the U.S. Census Bureau projects a nation with no clear racial or ethnic majority. 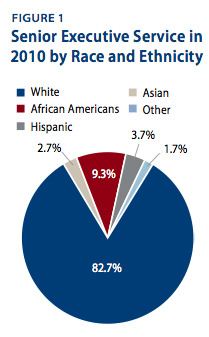 Fifty-four percent of the population will be people of color. But what about the federal government? 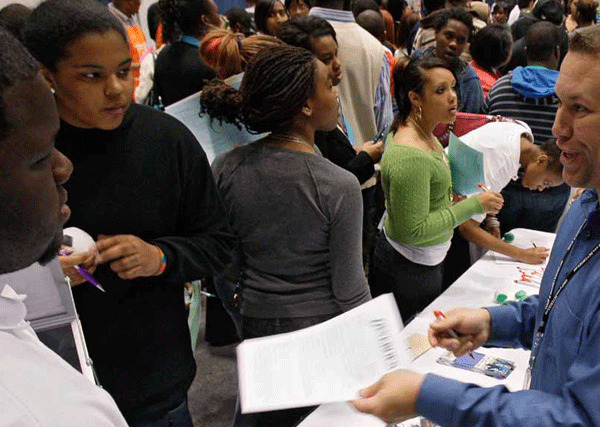 As the nation becomes more diverse, will the government reflect the diverse society it serves? That is the question the Center for American Progress’s Doing What Works and Progress 2050 teams seek to answer in this report. Specifically, we look at the ethnic, racial, and gender diversity of federal government’s most senior career public officials in the civil service. The career Senior Executive Service is a corps of around 7,000 senior managers. They work for the executive branch to help run agencies such as the Treasury, Internal Revenue Service, and the Centers for Disease Control and Prevention. The career Senior Executive Service works closely with political appointees who are also members of the Senior Executive Service, but when the White House changes hands, these senior career civil servants remain in their posts. In this report we refer only to these career Senior Executive Service members when discussing the SES. Hispanics will be vastly underrepresented in the Senior Executive Service. In 2030 we project it will be 6.8 percent Hispanic—less than a third of the likely representation of Hispanics in the civilian labor force according to the Department of Labor’s Bureau of Labor Statistics, which predicts that 23 percent of the civilian labor force will be Hispanic. Whites will remain significantly overrepresented. In 2030 we project that 71 percent of the Senior Executive Service will be white compared with 57 percent of the adult workforce as projected by the BLS. 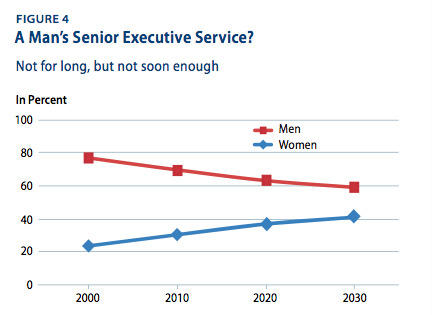 Women will remain underrepresented in the career Senior Executive Service. Women will occupy 41 percent of posts in 2030 compared with 47 percent of the projected adult workforce. 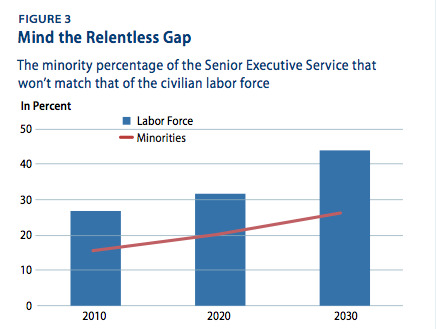 The career Senior Executive Service will include nearly the same percent of Asian Americans as the civilian workforce. Six percent of the Senior Executive Service will be Asian American compared with 7 percent of the projected civilian workforce. The percentages of African American members of the Senior Executive Service (14.8 percent) will likely reflect their share of the civilian labor force. • Pacific Islanders and Native Americans are likely to be significantly underrepresented. Our model predicts these groups will occupy up to 1.6 percent of SES roles, just less than half their likely representation in the labor force. Even by 2050 it is extremely unlikely that the nation’s most senior federal career staff will reflect the Hispanic share of the labor force. By then, 30 percent of the labor force is likely to be Hispanic, but we estimate that between 9.5 percent and 12.5 percent of the Senior Executive Service will be Hispanic. Our findings strongly suggest that there is an urgent need for action to address the diversity gap in the Senior Executive Service. Improving diversity will lead not just to a more representative senior civil service but a better government. A diverse workforce can significantly enhance organizational performance, for example by better serving customers, according to a number of studies. Moreover, for a government to effectively represent the citizens it serves and who pay for it, the government must look like its citizens. In short, the federal government must reaffirm its leadership in ensuring fair hiring and expanding opportunities for people of color and women. More than just the “right thing to do,” a more diverse workforce will lead to better government through greater efficiencies, more innovation, and better effectiveness. The federal government’s diversity is not a new concern. The Government Accountability Office, Office of Personnel Management, and the Equal Employment Opportunity Commission all commit significant time and resources to identifying the challenge and improving the federal government’s performance. Sen. Daniel Akaka (D-HI) and Rep. Danny Davis (D-IL) have introduced legislation to encourage improvement. And other groups, such as the National Hispanic Leadership Agenda, push for better representation at all levels of the bureaucracy. The Obama administration has demonstrated a strong commitment to addressing diversity. A recently published executive order seeks to improve the diversity of the federal workforce. This is a welcome step and a foundation for implementing the recommendations in this report. The executive order promises a government-wide strategic plan to promote diversity and inclusion by mid-November. Set an objective to close the diversity gap for the Senior Executive Service by 2030 so that representation of women and all ethnic and racial groups reflects their likely representation in the civilian labor force. Such approaches have been successful in the private sector and abroad. Set out interim milestones on the progress that should be made across executive branch agencies every four years commencing with 2015 in terms of representation of women and different ethnic and racial groups. Embark on a special initiative to increase the representation of Hispanics in the Senior Executive Service, including by creating a database of talented Hispanics who can be headhunted into key roles in federal government. Establish a new sub-committee of the President’s Management Council chaired by a Deputy Secretary which is responsible for overseeing work on diversity. Conduct a study within one year that better identifies the reasons for the diversity gap in the Senior Executive Service by analyzing data on the application, success, and promotion rates of women and different ethnic and racial groups, and benchmarking federal government against leading private-sector employers. Agency-specific objectives to close the diversity gap in the Senior Executive Service by 2030, including interim milestones for 2015 and every four years thereafter. Each agency should set its own objectives taking account of the current level of representation, the likely turnover in its most senior ranks over the coming years, and the type of work the agency performs. Agencies should also consider setting objectives for representation in key feeder grades, as increasing diversity in these grades will be key to making progress. Initiatives to strengthen the applicant pool for Senior Executive Service posts, for example, by seeking to attract the most talented minority and women applicants from inside and outside government for SES vacancies and for key vacancies at the so-called “feeder grades” of the GS-13, GS-14, and GS-15 civil servant rankings. These initiatives should have a special focus on Hispanics. Measures to identify and support emerging minority and female talent who might form part of the Senior Executive Service of the future. Initiatives should be focused on GS-13, GS-14, and GS-15 staff and work to build a cadre of talented women and people of color who would be strong candidates for future Senior Executive Service vacancies. These initiatives should target the strongest minority and women staff in these feeder grades and offer them intensive support to maximize their career potential including mentoring, training, and networking opportunities. A pilot of centralized recruitment in agencies so that at least a third of Senior Executive Service vacancies are filled by generic recruitment to the SES rather than to a specific post. Talented minority and female applicants should be encouraged to apply from other agencies and from outside government. Some smaller agencies with few vacancies should work on joint recruitment. As the federal government pursues this agenda, it needs to exercise care. Most importantly, it should focus on attracting the very best minorities and women into the Senior Executive Service by identifying and developing talent in the promotable ranks of the civil service below the Senior Executive Service, and by increasing the flow of skilled applicants into the career civil service. But when hiring into the Senior Executive Service, it should always look for the best people it can find regardless of ethnicity, race, or gender. The recommendations above are designed to do precisely that. Never should anyone responsible for recruitment into the Senior Executive Service feel they should offer someone a job merely because of their ethnic, racial, or gender background. Not only would that lead to a poorer-quality government but it would also undermine the confidence of all applicants, not just minority groups and women. This is a unique moment to set the government on course for a Senior Executive Service that represents the people it serves. The Obama administration has made an excellent start by issuing an executive order on diversity and inclusion. High turnover due to baby boomer retirement is likely to continue producing opportunity in the form of job openings. And at a time of austerity and complaints over the size of government, it is important that the nation gets the most out of its tax dollars. A more diverse workforce does just that. Over the next few months, the administration will set out a detailed strategy to promote diversity and inclusion and each agency will put together its own action plan. It is essential that closing the diversity gap in the Senior Executive Service is central to those plans. In the pages that follow, we detail those gaps and the specific remedies outlined above. Jitinder Kohli is a Senior Fellow on the Doing What Works project at the Center for American Progress, John Gans is a Ph.D. student in international relations, strategic studies, and international economics at the Johns Hopkins University School of Advanced International Studies, and James Hairston is a Research Associate in Economic Policy at American Progress.